Powered by the VIAVI Solutions StrataSyncTM platform, CERTiFi empowers every team member with the information needed to complete tasks accurately and on time. Request a free CERTiFi account now. Certifier is not only the most advanced solution available, it is also the fastest and most complete for copper or fiber certification. 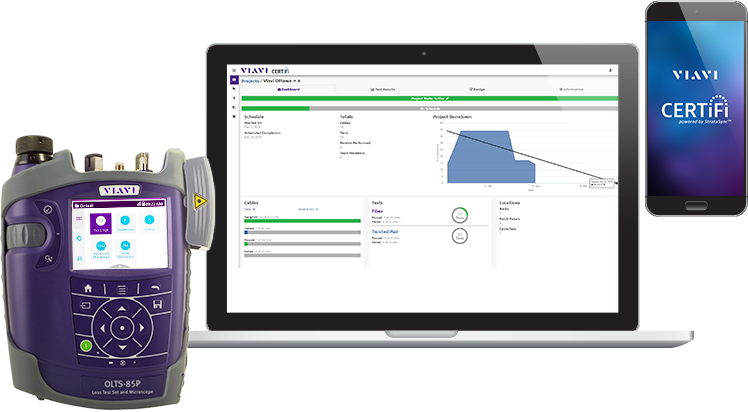 SmartClass Fiber OLTS-85P promotes best practices while cutting Tier 1 fiber testing and certification time in half. 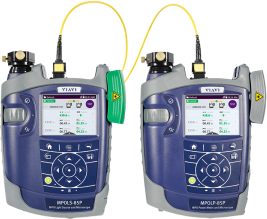 Have confidence in your network quality and optimize your workflow with a dedicated point solution for fiber testing. Whether a project is big or small, it is essential for each member of the team to understand which tests need to be performed, by whom, when, and where. For project managers, this is an even greater challenge; with constant emails, phone calls, paperwork, file attachments, and more, details can easily get miscommunicated, ignored, or forgotten. CERTiFi eliminates these hassles by giving team members a central resource where all the test & certification details of a project are communicated, assigned, and managed – from start to finish.